This is a plant known in Swedish as Svärmorstunga (Mother-in-law’s tongue). Who knew a houseplant could be so useful? Nurse Angry’s mother was a recycling fanatic, just like Nurse Angry herself. Woe betide the family member who puts anything recyclable in the *GARBAGE*. Nurse Angry’s mother had a legendary wooden contraption not unlike an umbrella that she used to dry plastic bags on. Nurse Angry has taken things one step further since in Stockholm we recycle glass, newspaper, cartons, plastic and aluminum packaging. Here Nurse Angry has ingeniously involved Mother Nature herself in the recycling. Further proof that we all turn into our mother. 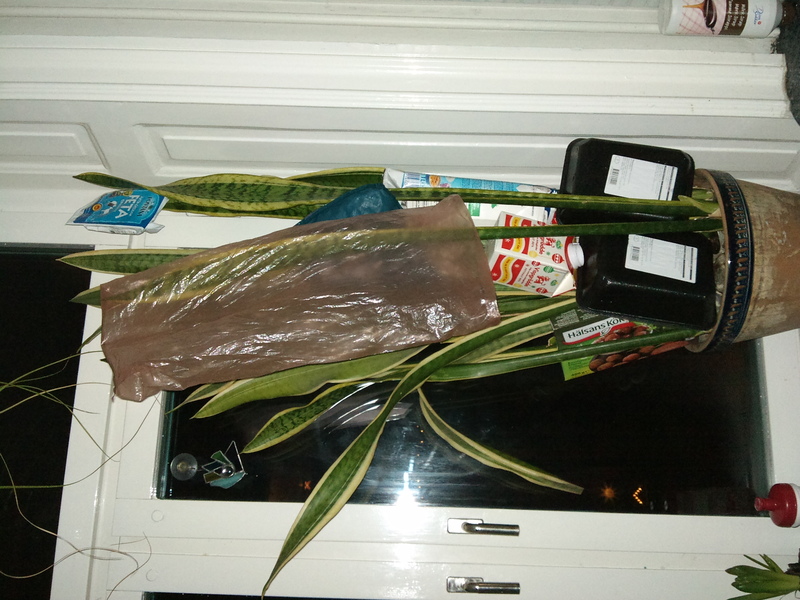 This plant now complains about feeling naked when it is not decked with at least 5 plastic bags, 4 plastic and minimum 1 cardboard cartons, 2 or 3 cat food cans. Baby bib optional, now rarely seen. Ah, a woman after my own heart, just not the other day I recycled an alligator and made it into a most stylish pair of shoes. Nurse Angry truly appreciates such creativity in our modern world of ready-made solutions, bake-off bread, boy bands and Pot Noodle. If you really want to impress Nurse Angry your next step might be to take a pair of shoes and turn it into a most stylish alligator.